During his teen years in Lancaster, California, Van Vliet developed an eclectic musical taste and formed friendship with Frank Zappa, with whom he sporadically collaborated. He began performing with his Captain Beefheart persona in 1964 and joined the original Magic Band line-up, initiated by Alexis Snouffer, in 1965. The group drew attention with their cover of Bo Diddley’s “Diddy Wah Diddy”, which became a regional hit. It was followed by their acclaimed debut album ‘Safe As Milk’, released in 1967 on Buddah Records. After being dropped by two consecutive record labels, they signed to Zappa’s Straight Records. As producer, Zappa granted Beefheart unrestrained artistic freedom in making 1969’s ‘Trout Mask Replica’, which ranked 58th in Rolling Stone magazine’s 2003 list of the 500 greatest albums of all time. In 1974, frustrated by lack of commercial success, he released two albums of more conventional rock music that were critically panned; this move, combined with not having been paid for a European tour, and years of enduring Beefheart’s strict discipline, led the entire band to quit. Beefheart eventually formed a new Magic Band with a group of younger musicians and regained contemporary approval through three final albums: ‘Shiny Beast (Bat Chain Puller)’ (1978), ‘Doc At The Radar Station’ (1980) and ‘Ice Cream For Crow’ (1982). Van Vliet has been described as “…one of modern music’s true innovators” with “…a singular body of work virtually unrivaled in its daring and fluid creativity.” Although he achieved little commercial or mainstream critical success, he sustained a cult following as a ‘highly significant’ and ‘incalculable’ influence on an array of New Wave, punk, post-punk, experimental and alternative rock musicians. Known for his enigmatic personality and relationship with the public, Van Vliet made few public appearances after his retirement from music (and from his Beefheart persona) in 1982. He pursued a career in art, an interest that originated in his childhood talent for sculpture, and a venture that proved to be his most financially secure. His expressionist paintings and drawings command high prices, and have been exhibited in art galleries and museums across the world. Van Vliet died in 2010, having suffered from multiple sclerosis for many years. 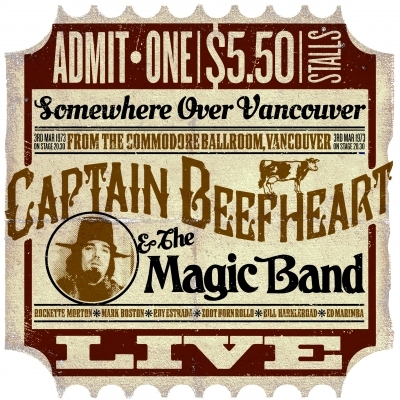 Captain Beefheart ‘Commodore Ballroom, Vancouver 1973’ Rare Concert Recording Now Available! 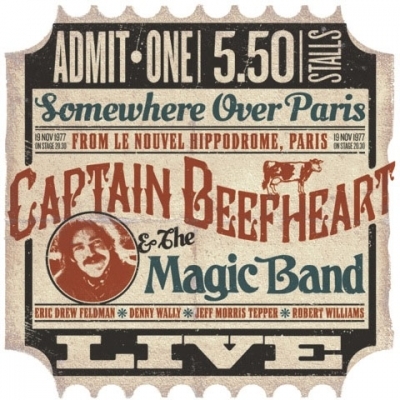 Captain Beefheart ‘Le Nouvel Hippodrome, Paris 1977’ Rare Concert Recording Now Available! “This band is so good – the best I have ever had! They play with a smile. They really breathe up there when they are playing. After all this time I have finally found the band I’m looking for. It’s amazing! Playing with this group is like going for a walk: they are so happy when they play. People I meet from the audience have been coming up and telling me how pleased they are that I have finally found a band that I am content with – and they are right. “The gig we played in Paris was monstrous. It was three days ago, but I haven’t slept since – it was so good! And my voice, well, I can still feel that show in my voice. It hit me so hard I am down to three octaves …. I couldn’t get over the way the audience was singing along with it, singing the words back at me in English – and I don’t speak a word of French. 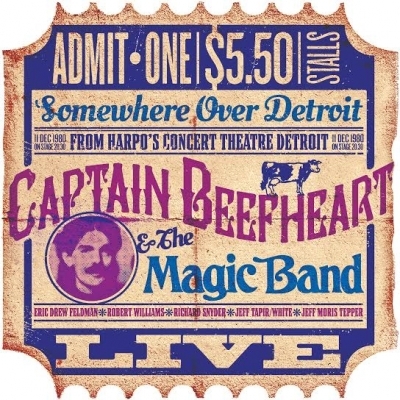 London, UK – Much to the excitement of Captain Beefheart fans worldwide, on April 28th Gonzo Multimedia will be releasing on CD a rare live recording of the Captain in concert at Harpo’s in Detroit, Michigan on Dec. 11, 1980! Don Van Vliet (born Don Glen Vliet; January 15, 1941 – December 17, 2010) was an American musician, singer-songwriter, artist and poet known by the stage name Captain Beefheart. His musical work was conducted with a rotating ensemble of musicians called the Magic Band (1965–1982), with whom he recorded 13 studio albums. Noted for his powerful singing voice with its wide range, Van Vliet also played the harmonica, saxophone and numerous other wind instruments. His music blended rock, blues and psychedelia with avant-garde and contemporary experimental composition. Beefheart was also known for exercising an almost dictatorial control over his supporting musicians, and for often constructing myths about his life. This extraordinary new CD catches the Captain at his best; live on stage in 1980 during the tour for ‘Doc At The Radar Station’. London, UK – Don Van Vliet, (1941-2010) better known to his legions of fans as ‘Captain Beefheart’ was one of the most enigmatic figures in rock music. Unashamedly an artist, rather than a pop star, he forged his own idiosyncratic furrow through popular culture, producing some of the most innovative and uncompromising music ever committed to recording tape. From the age of three he painted and sculpted, and had an obsession with animals and the natural world. As a teenager he was friends with Frank Zappa, and as early as 1963 they recorded a demo under the name ‘The Soots’. Sadly this was unsuccessful, and the world would have to wait a few more years before Beefheart’s own unique take on the blues would be heard by anyone outside his own particular circle of friends. His first album, ‘Safe as Milk’ came out in 1967, and Hunter Davies’ eponymous biography of The Beatles notes that John Lennon was an early fan. It is not surprising considering that the primal rock and roll that Lennon idolized and the pioneering surreal blues of Captain Beefheart and the Magic Band, had much the same cultural genesis. Probably the most important album of the Captain’s career was the Zappa produced ‘Trout Mask Replica’ which was released in 1969. Its mixture of blues, free-form improvisation and heavily structured Van Vliet avant-garde compositions proved too much for many listeners but eventually ensured him a place in the history books. High profile fans of this album include the late John Peel, who would remain a champion of Beefheart’s until he died. In 1972 Captain Beefheart released two albums; ‘The Spotlight Kid’ and ‘Clear Spot’. He also toured the UK and Europe with the Magic Band, even performing two concerts at London’s famed Royal Albert Hall. 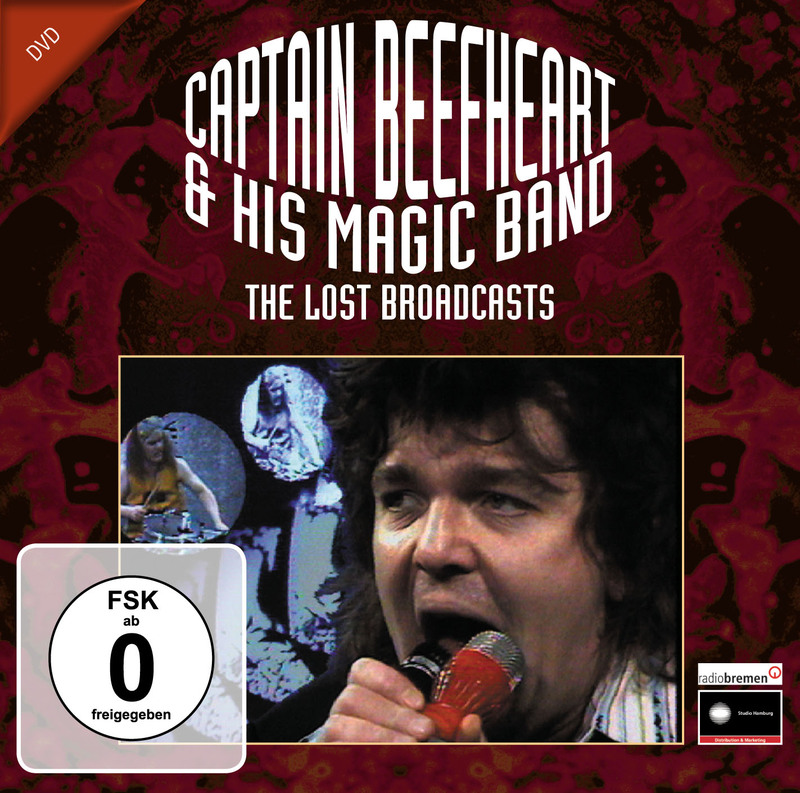 On April 12th , in the middle of the European leg of the tour, Captain Beefheart and The Magic Band stopped off at the Beat Club studios in Bremen, Germany to film a session for later transmission. Of the four songs filmed that day only one track has ever been broadcast. The band at that time included: Captain Beefheart (Don Van Vliet) vocals, harp; Rockette Morton (Mark Boston) guitar and bass; Zoot Horn Rollo (Bill Harkleroad) guitar; Orejon (Roy Estrada) bass; Ed Marimba (Art Tripp) drums; and Winged Eel Fingerling (Elliot Ingber) guitar. Author Jon Kirkman describes the recordings: “The session kicks off with a bass solo entitled ‘Mascara Snake’. This short piece was named after a former member of the Magic Band Victor Hayden (Don’s cousin), who had appeared on the ‘Trout Mask Replica’ album. The solo is played by Mark Boston, although at this point former Mothers of Invention bassist Roy Estrada had joined The Magic Band following his departure from Little Feat in early 1972. The other songs in the set here include a track dating back to ‘Trout Mask Replica’ (‘Steal Softly Thru Snow’) and also a track that would be featured on ‘Clear Spot’ some eight months later (‘Golden Birdies’). Now, over 40 years later, much to the excitement of Capt. Beefheart fans worldwide, premier UK label Gonzo MultiMedia will be releasing these historic Beat Club sessions on DVD titled ‘Capt. Beefheart and his Magic Band – The Lost Broadcasts’. These films have not been seen in over 4 decades and are the complete sessions from April 12, 1972. Only one song was broadcast at the time and then never to be seen again. This DVD contains all the material filmed during that session now available for the very first time!